Yes. They pretty much swept the rap category. And when you look at who he was up against for Best Rap Album (Kendrick Lamar, Jay Z, Kanye West, and even Drake), Macklemore’s win feels like a slap in the face. . There are the obvious questions. How do white people dominate a traditionally black category even when up against legends? How does anybody beat Kendrick Lamar – the new artist dubbed as rap’s savior? Who the hell chooses these winners? But the last question is the only one that matters here. The Grammy winners are decided by the Recording Academy, and sales, buzz, and general famous-ness are supposed to be left out of the decision-making. Just who makes up the Recording Academy? It is comprised of singers, songwriters, engineers, producers, managers, and other professionals working in the music industry. Voting members must meet specific guidelines, but in the end, the Academy is made up of the artists and those that work alongside them. Somehow, the industry taste makers (outside of the rap world) got it in their heads that what Macklemore and Ryan Lewis put out last year was the best representation of rap. They thought that, in the face of other solid and critically acclaimed efforts, the purveyors of “Thrift Shop” and “Same Love” came out on top. And it is the substance above all else that I take issue with. I got into a mini-debate with someone on Twitter regarding this tweet. 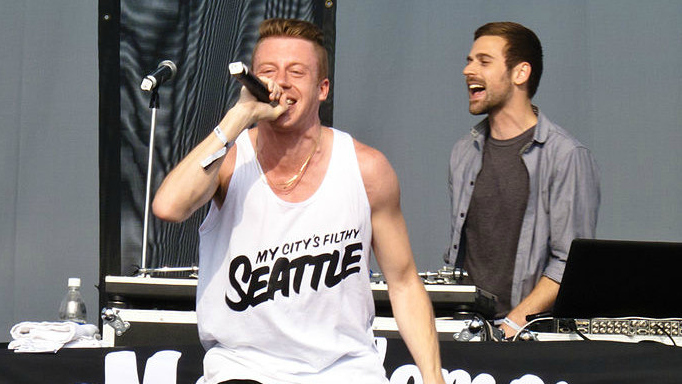 @TheJayLuveShow @macklemore Never said it was. But compare #Eminem to #Macklemore … the rap Grammy committee even denied Macklemore. I can’t help but feel that their subject matter and “crossover appeal” (as if they are crossing over from something) played a lot into their wins. Lots of people like to laugh at the prospect of buying terrible looking cast offs from thrift stores for cheap. And the issue of gay marriage was hot all last year. So maybe Kendrick was just taking himself too seriously. Maybe instead of talking about “New Slaves”, Kanye should have focused on the pitfalls of civil unions. Not to minimize those issues as they are incredibly important. But, to raise them above others in the category simply because they are salient topics in unfair. But I digress. Some might defend his work, saying “Hip-Hop is about having fun and sharing a message.” And that much is true. Those notions are at the core of the art form. However, were you more likely to hear their work on a pop or rap station last year? In all of the rap conversations had, were they even mentioned? I rest my case. And that was enough. We could have ended it there. We could have all moved on and looked forward to next year. But then Macklemore went and texted condolences to Kendrick Lamar, and then posted said text on his Instagram. The message is nice, and I don’t doubt that he meant what he said. But by publicly sharing this message he all at once confirms that he knows he shouldn’t have won and further – publicly – rubs it in Lamar’s face that he won’t get it. This takes #SorryNotSorry to a whole new level. It all comes down to this: those that know rap denied them; those that don’t know rap awarded them. Ladies and gentlemen, this is how you appropriate an art form. Macklemore, Robin, and Miley have figured the system out. At some point, we’ve got to admit that to ourselves and stop pretending like we can take them seriously.